Since 1980 Persian rug repair service for Encino and San Fernando Valley has been provided by Antique Rug Company’s rug repair workshop. 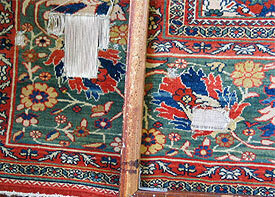 Call to bring your rugs for an in-person inspection and advice or to schedule a pick up. Your handmade rugs are valuable works of art. Whether antique, old, vintage, collectible, family heirloom or new, rugs should be maintained as they are used over the years. We recommend following the maintenance and conservation suggestions listed at our RUG CARE section to maintain your rugs in good condition. 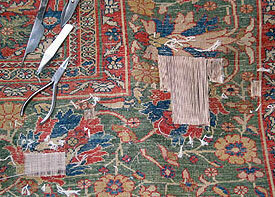 But when accidents cause rug damage, it is our advice to repair your rug early and avoid risk of additional damage. Our knowledgeable rug weavers and restorers can provide you with maintenance, repair and restoration advice and options. 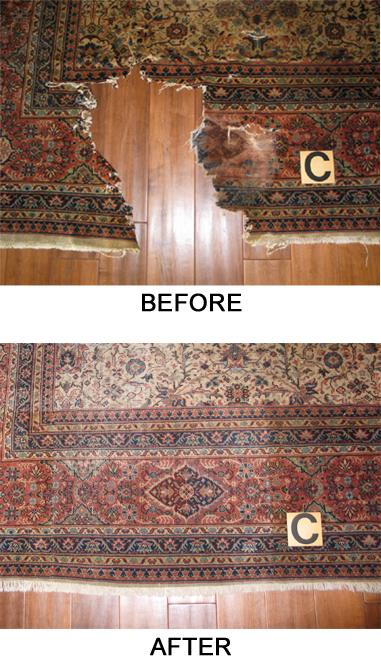 Examine your rug thoroughly to determine if Oriental rug cleaning is beneficial or necessary. 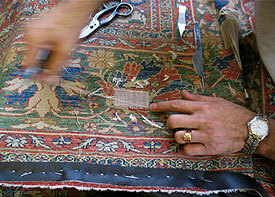 Rest assured; your valued handmade rug is in good hands at Antique Rug Co.